Owner and well-known industry figure James Knight of bookmaker Corals tweeted his possible interest in getting a young horse. Eamonn Wilmott, owner of Horses First Racing was, unusually for him, already up the tower at the Sutton Veny farm and helping out by timing the horses as they worked (Hill gallop pictured above). Having a few minutes between lots Eamonn tweeted back “how about a twitter syndicate? 50 members pay £400 each and £50 a month – gives us a budget of £20,000 for a horse”. James immediately loved the idea and re-tweeted it which is when the fun started. The response was instantaneous and overwhelmingly positive, within an hour there were dozens of members signing up from Gibraltar, Ireland, Spain and throughout the UK. Later in the day the Racing Post picked up the story and the idea spread faster and more widely. By this morning new members from Singapore and Australia had also signed up and press interest has continued to increase with reporters from as far away as Australia getting in touch. Eamonn Wilmott has a very dependable intuition when it comes to potentially successful new ideas. An entrepreneur who was born in England in 1961, he moved to California where he published the book Supercomputing Review and, based on its success, founded an award-winning magazine of the same name. He then went on to launch what was probably the world’s first commercial Internet service, aimed at the Super Computing market. Mr Wilmott returned to the UK in the mid 90s and set up what was to become Europe’s most successful web services company, founded as Online Magic, with Andy Hobsbawm. The company later became part of the Agency.com network. MrWilmott oversaw the launching of Europe’s first real-time credit card verification system, the world’s first e-zine, and web sites for Manchester Utd., British Airways, Sporting Index, Channel 4 and others. He was part of the team that took Agency.com public in 1999 at a market capitalisation of over 2 billion dollars. Mr Wilmott left Agency.com around the turn of the millennium, for a new life in Wiltshire, England. 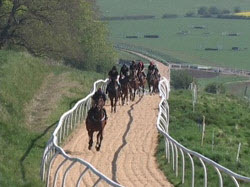 A long time racing enthusiast, he and his wife Oriana converted a former dairy farm in the Wylye valley and established a state of the art racehorse training centre, which now employs over 20 people and can train up to 70 horses. ‘Horses First Racing’, co-owned with Tony Bloom, employs a leading Australian trainer, Jeremy Gask. Mr Wilmott is also a director of ‘Equine Health Centre Ltd.’ a company which supplies and installs horsewalkers, including the ‘Seawalker’ which Wilmott developed in 2005. In July 2010 Wilmott was appointed Chairman of the Board of Thoroughbred Owner and Breeder Magazine. Details of the #Twitterhorse syndicate: £400+VAT per share and then £50+VAT a month all in by standing order (or £250 per six months). VAT can sometimes be reclaimed – we will provide details. There will be 50 members in the syndicate. Jeremy Gask is buying a horse at the breeze-ups this week and we will post up pictures and pedigree immediately. Definitely part of the package will be a box at the races and a private party for all syndicate members here at the farm. Race day tickets willl be available free on rotation (we can normally buy extras at half price). Syndicate members will be welcome to visit the farm to watch their horse work and will also receive a weekly update on all of the yard’s runners. Full owner benefits can be seen on our owners package. All syndicate members are entitled to a full share of prize money – usually paid out at the Christmas party. The plan will be to keep the horse in training for two years and then for him/her to be sold at the horses in training sale in October 2012. If an offer should be received for the horse while it is in training, the syndicate members will be given the opportunity to vote on whether to accept any offer. All members will recieve a full share of any proceeds from any sale. The horse’s name, the syndicate name, and the racing colours will be voted on by the syndicate. The main thing is we will do everything possible to make this as fun as possible for everyone involved. The above stuff is guaranteed but we will try and be creative and come up with other fun ideas.